.ROOTS; Seven Writers, Seven Novels. I had always thought of myself as a playwright but five years ago virtually stopped writing drama. Instead I wrote some humorous poems, short stories, and last year a psychological thriller set in Yorkshire between 1979 and 1981. Despite being taken on by a literary agent, I realised that I still know comparatively little about how the traditional publishing industry works. I thought it might be interesting to follow a bunch of writers over the course of a year, each of whom are having a novel published. I Tweeted the idea and had an incredible response. Within a couple of days, over 50 writers had contacted me to express an interest in taking part. I realised at this point that I needed some help, and fast, so I teamed up with writers Eva Harlsband and Hannah Persaud to help me run the blog. We have now selected our seven writers. Their contracts are with small independent presses, mid-range and digital publishers, and one novelist who signed a significant book deal when a publisher pre-empted a major auction. We will reveal all seven writers when we go live on 11 January. 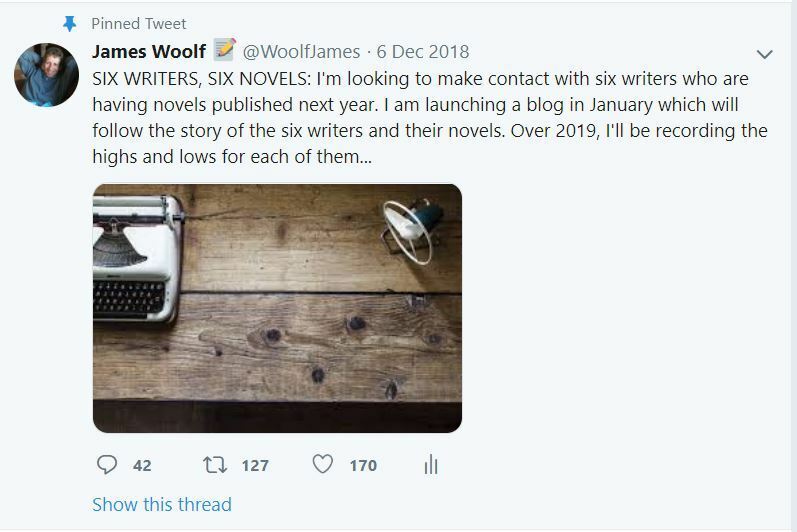 There will be monthly blog posts throughout 2019 where we will check in with the writers, and what’s been happening in connection with their novels. The writers may be dealing with book jacket designs, have just attended their launch, or be basking in some great reviews (or otherwise!). We want to get beneath the surface, reveal stuff that other writers will want to read (Did they receive and advance? What are their publishers’ plans for promotion? Have they sold the rights to any other countries?) as well as giving some useful publicity to the writers themselves. We have had a fascinating time reading about the novels and journeys of our very different authors and it was incredibly difficult to make the final choices. We owe huge thanks to our writers who are willing to share their journey to publication and beyond. And it’s certainly no exaggeration to say that some of their life stories are as remarkable as their novels. It is going to be a fascinating year! If any readers of Cent would like to receive an email to let alert them to the publication of the monthly blog, they should leave their details on James’ website via the contact page https://woolf.biz/ . In any case we hope you will come and join us to learn a little more about the world of fiction publishing.